Even the highest quality bags experience wear and tear with use. But some are so well made and loved that they are worth mending many times over. 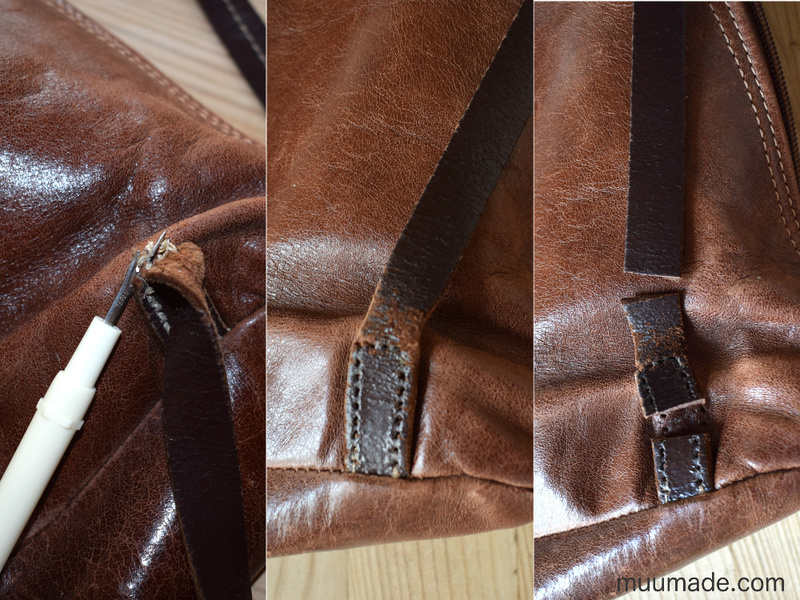 In this post, I want to share how I repaired the leather straps of one of my favorite backpacks. If your bag or backpack has a leather strap that is getting thin or is starting to rip, like the straps of my backpack shown above, then you may be able to repair it by CUTTING OUT the sections that are worn out! 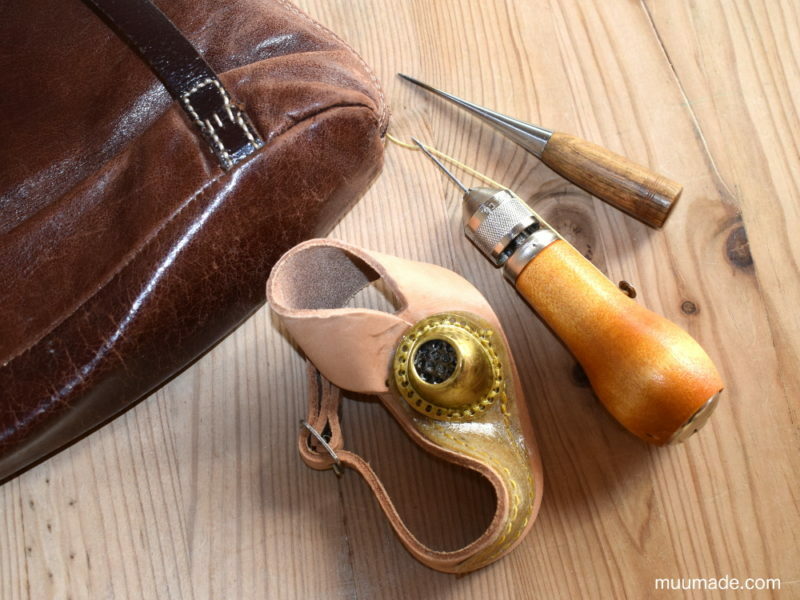 Note: My repair job worked well because I was able to sew the repaired section of the leather strap to the bag itself, thereby reinforcing the joint. If the wear of your leather strap is in a place where you cannot attach the strap to your bag, then you will probably have to overlap the two ends or add a layer of leather or fabric to reinforce the new joint when reconnecting the cut strap. If you need to remove existing stitches before cutting the strap, I recommend that you use a seam ripper, as shown on the left in the photo above. The center image above shows a worn strap. And the right image shows the same strap after I cut out the section that was stretched and thinned. After removing the worn-out section from the strap, I sewed the cut edges back together. But before doing so, I suggest that you make needle holes first (as highlighted in green in the left image above). 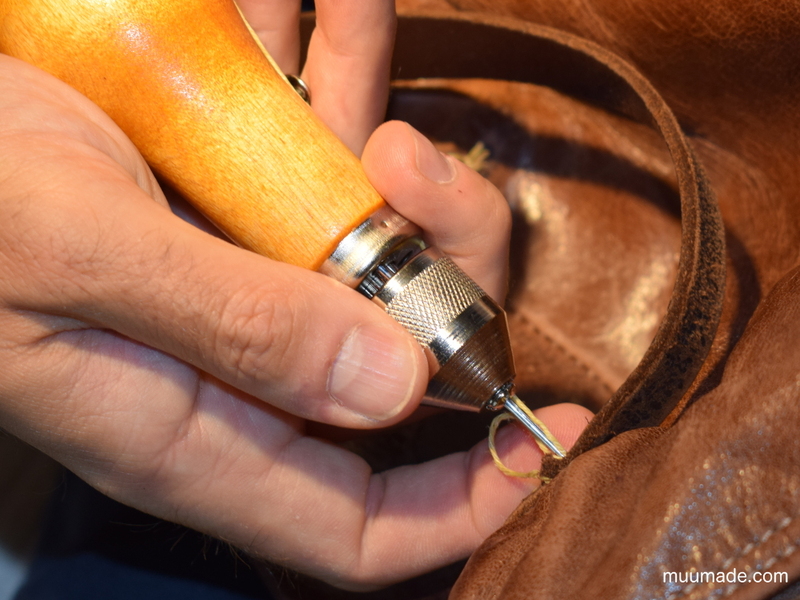 A straight tailor’s awl is great for this purpose. 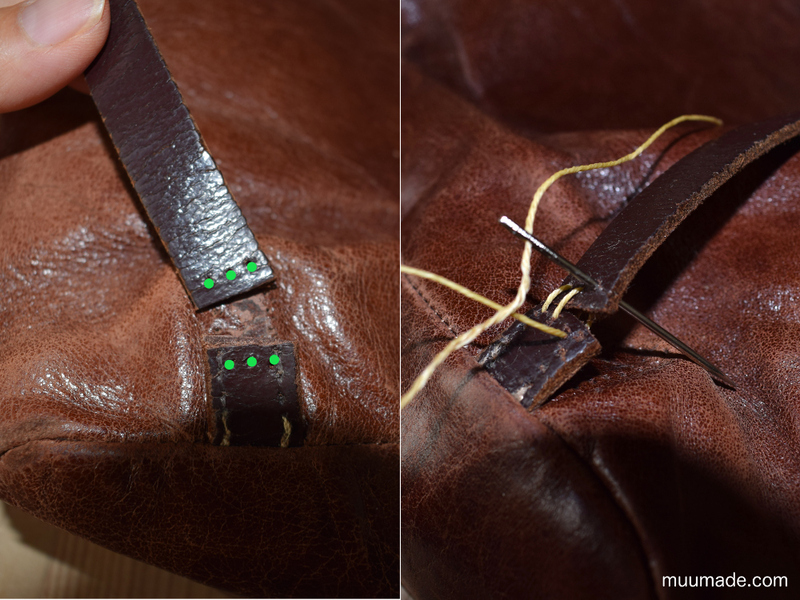 As shown in the right image above, I used a heavy duty needle for sewing the leather (called a Glover needle or Glover’s needle) and thick waxed thread to sew the strap back together. 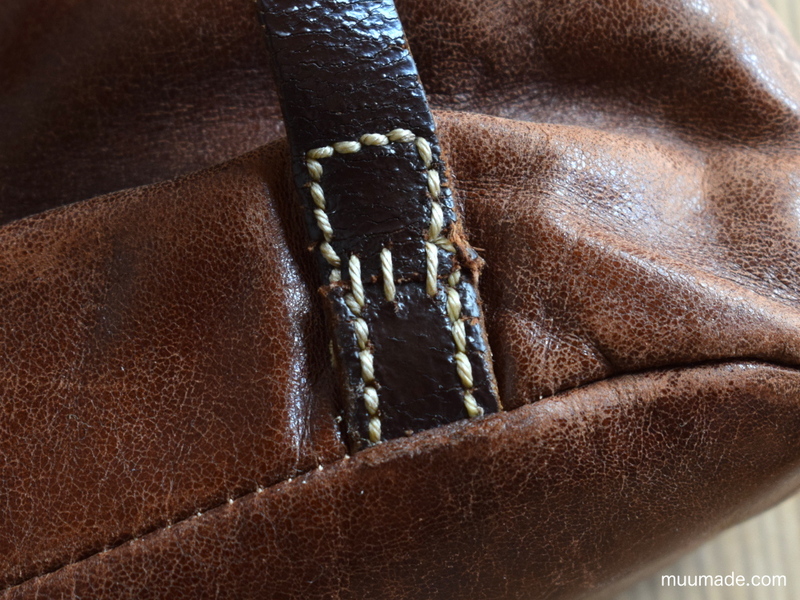 You do not have to make stitches as large as mine, but make sure to avoid sewing too close to the edges of the leather to prevent them from fraying. 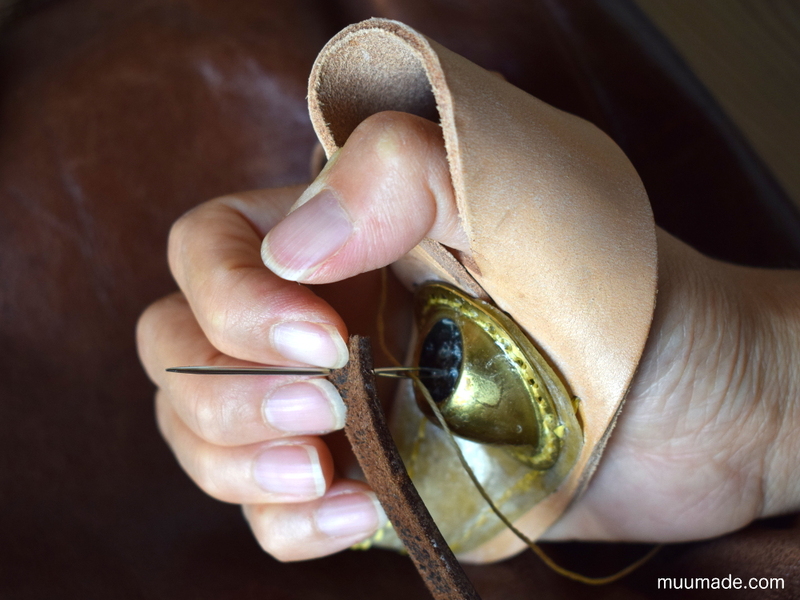 A leather sewing palm, like the one shown above, may come in handy if the leather is thick. It is a tool that helps you push the needle through tough materials while protecting your palm from the end of the needle. 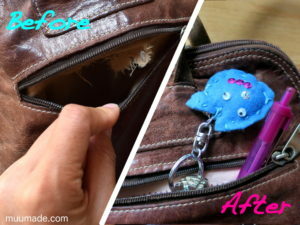 To re-attach the straps to the bag, I used a sewing awl, which is a tool to hand-sew heavy materials such as leather. It can be used to make straight stitches like a sewing machine (see the photo below). Here is the result. The stitches are not perfect, but I hope that they are sturdy enough for the straps to last many more years! Lastly, once you mend the leather straps of your bag or backpack, remember to care for the leather so that it ages with dignity! Here are some suggestions on how to care for leather. If your bag’s lining or pockets are also in need of repair, you may be interested in my post on how to fix a bag’s lining and pockets.